Mid-East 16 Inch Lyre Harp 10 String + String Set & Case. 10 string Lyre Harp. 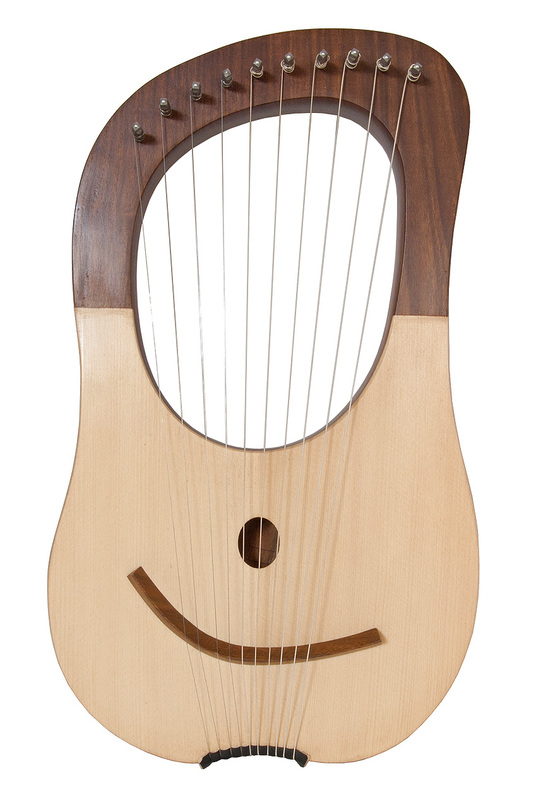 The solid sheesham body lends itself to the soft gentle curves of this ten string lyre. The ten metal strings provide a classical sound that is enhanced by the solid spruce soundboard. When you are not playing, you can hang it up as a piece of art; it's that pretty. Roosebeck Harp Tuning Tool, Small code HPTS; Case; and Extra string set. A more authentic tuning derives from Judaic worship music, where the instrument was used to accompany the singing of the Chazzan, also known as a Cantor. This style of tuning uses the Chazzanut mode; starting with the bass largest strings tune as follows: D E F G# A B C D E F.
Two alternative methods of tuning that work well with singers comfortable in the Key of G are: again bass to treble: E F# G A B C D E F# G and D E F# G A B C D E F# E is tonic Notice, in the second tuning, all the notes are the same but you're starting on D rather than E. However, try an inspirational tuning of your choice.